The word ragù instantly conjures up visions of warm kitchens, family meals, and comfort food. Slow cooking...long braises...tomato based (traditionally) meat sauces, usually containing some sort of wine...what's not comforting about that? But sometimes I cheat and go for something equally as hearty and flavorful, yet cooked in far less time. Let's call them rapid ragùs. This one in particular still features tender, slow-cooked meat—it's just that I didn't simmer it in the sauce itself. I love slow roasted duck and duck confit (duck legs that have been cooked slowly in their own fat), and while I don't mind taking the time to cook either, Maple Leaf Farms offers some awesome pre-cooked options. That means that I can have slow roasted meat at my fingertips, whenever. I made this ragù at the end of last week (you may remember me telling you that there was a thick blanket of snow outside my window). It all started with a couple of little ovalular spaghetti squash sitting on my counter. 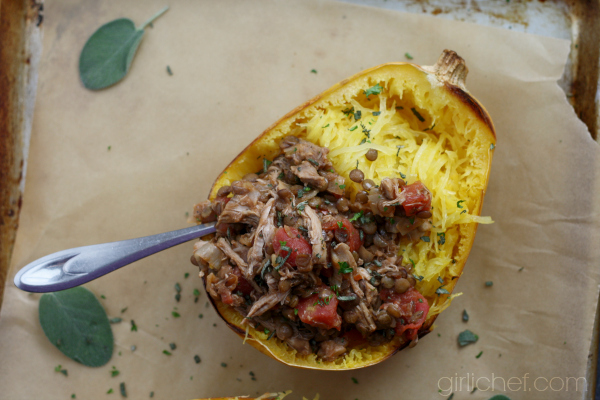 Spaghetti squash just so happen to be my favorite type of winter squash...well, any squash really. More often than not, I'll just roast and scrape one and eat it with some Italian sausage and kale; that's one of my favorite meals. But since I've shared that recipe before, I knew I had to come up with something else. I mean, that is the point of 12 Weeks of Winter Squash. Stepping outside and trying new things, new combinations...coming up with new favorite uses for these sturdy squash varieties. Fortunately, I had pulled a couple of roast duck halves from the freezer two days earlier. The brainstorm didn't last long, because the minute I laid eyes on that, I knew what I was making. Combined with one of my other favorite ragùs of the rapid variety, a lentil ragù—the final result was worthy of slow-cooked comfort food status. Tender pulled duck meat and lentils come together in this comforting ragù. Served with roasted spaghetti squash to make a satisfying meal (aka comfort food). Preheat oven 400° F. Line a baking sheet with foil and lightly oil it. Cut spaghetti squash in half, then scrape and scoop out the seeds (I use the scoops from the OXO 2 Piece Fruit Scoop Set - they are amazing for scooping the seeds from any squash). Set halves cut side down on lightly oiled baking sheet. Roast until tender, 45-50 minutes. Flip and scrape a fork through once it's cool enough to handle. In the meantime, pull meat from duck bones; reserve. Rinse the lentils and pick out any bad ones or hard bits. Place them in a pot with the sage and garlic and cover with water by an inch or two. Bring to a boil, then partially cover and reduce heat to a simmer for 25-30 minutes or until just tender. Add more water if it gets too low. Drain, reserving about 1 cup of the cooking liquid (discard sage and garlic). If you don't have a cup left, add water to make a cup. While the lentils are cooking, heat the olive oil (or duck fat) in a saucepan and saute the shallots until they have broken down and begun to look a bit sticky, about 10 minutes. Add the tomatoes and their juices, along with the wine, reserved duck meat, crushed red chiles, and big pinch of salt and pepper. Simmer for ten minutes or so, stirring now and again, until the tomatoes start to break down, 10 minutes or so. Add the lentils and the reserved cooking liquid and simmer very gently for another 10 minutes, to allow all of the flavors to come together. Taste and adjust seasoning as needed. It should be fairly loose (but not all-out wet), if it seems too dry then stir in a bit more water. 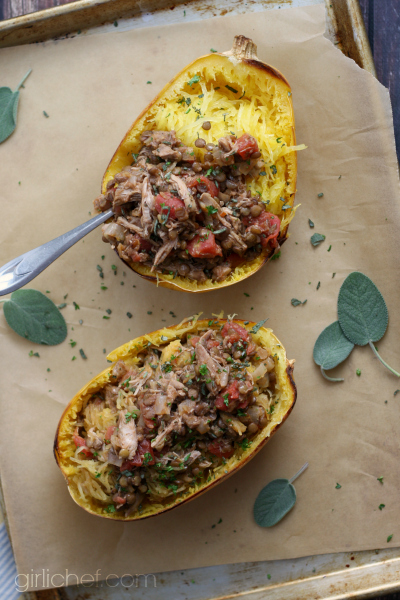 Toss the spaghetti squash strands in with the lentil ragù and return to the hollowed squash shells or pile on plates. 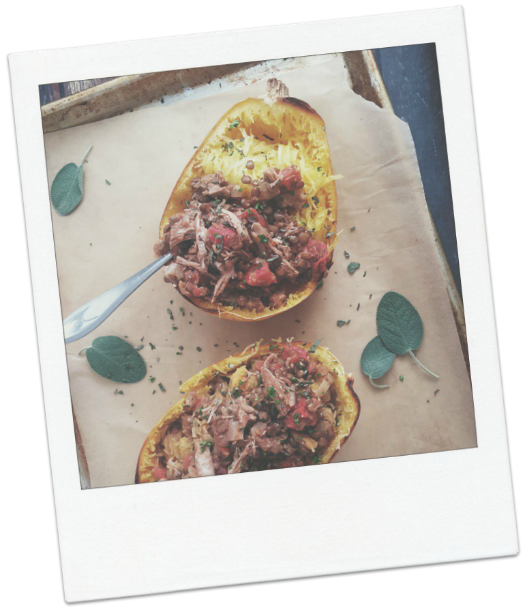 (Alternately, you could plate up the spaghetti squash and heap the ragu on top.) Sprinkle with chopped herbs and serve! Maple Leaf Farms also sells cooked, pulled duck meat if you don't want to take it off the bone yourself. Feel free to use a duck that you've roasted yourself, as well. You're looking for approximately 1 pound of meat pulled from bone (give or take).